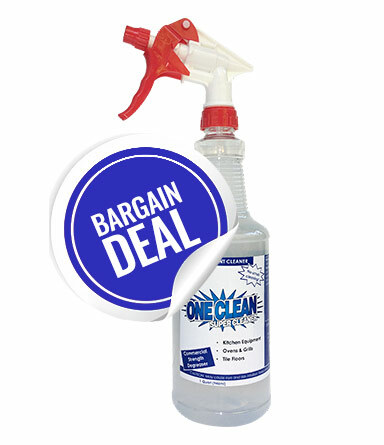 For the most difficult oil and grease stains allow mixture to stay on the concrete floor or stained area of the floor overnight. A smoother surface will need less time than a rough surface. For light soil: 4 oz. 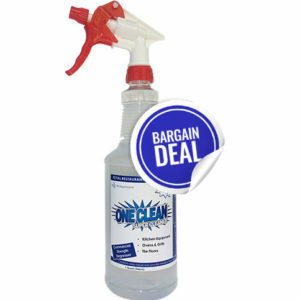 OneClean plus enough water to fill a spray bottle. Do not use if temperature will be below freezing (32oF). Do not use on deteriorating pavement. Do not apply directly to lawn or shrubs. 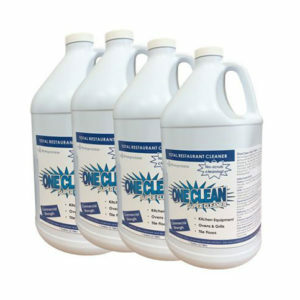 Avoid use on aluminum, galvanized steel or soft metal surfaces. Use caution. Surfaces may be slippery when wet. Wear safety goggles and protective clothing when boiling-out fryers. 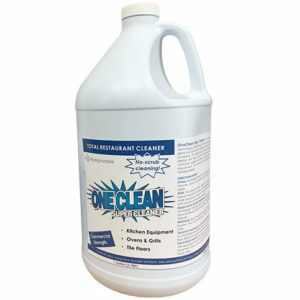 As with all cleaning products follow regulations for discharge and disposal. Eyes: Immediately flush eyes with cool running water for at least 15 minutes. milk or water. Call a physician. Skin Contact Wash off with water. Caution: Avoid eye or prolonged skin contact. Contains alkaline salts.